I remember the ads for the new Mustang when it was introduced in 1964. I knew that I liked the car and don’t remember a true desire to have one, but hey I was just a tyke then. By the time the 1967 body style came out, I was closer to driving age. I liked the more muscular look of the redesign, but ended up driving a hand me down 1962 Falcon until I graduated. Shortly after high school graduation, I bought a 1967 Mustang convertible. 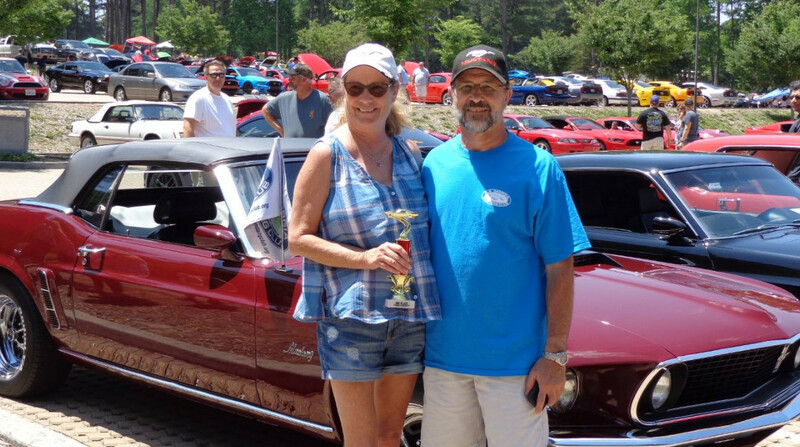 I drove it for a couple of years until an early 1950’s Chevy turned in front of me, and it was a contest that the Mustang couldn’t/didn’t win. Cher had also had a 1967 fastback as her first car, and I’ve very been fortunate that she’s been very supportive of my addiction and involvement with the hobby. After a couple of other Ford products and some time spent with the Mopar brand, we came back to Mustang purchasing a 1995 coupe. I was a big fan of the new body style but I traded it on a 2001 that met a similar fate in 2003 as the 1967, only my fault this time. At that time, I knew a redesign was coming in 2005, and had seen enough to know that I liked the body style, and decided to be Mustangless until then, which turned into 2007. We finally bought a 2007 GT that wasn’t my daily driver. With both kids either out of the house or close to being out, so we enjoyed more free time and started showing the 2007 and joined the NEGMC. Later that year we also bought my 1969 convertible which was in bad need of restoration. After the 1969 restoration was completed in 2011, we took it to its first show at the Gwinnet Braves stadium and took a best of show. As part of winning, we got to drive the two young ladies that were throwing out the first pitch into the stadium. This was quite a start for us with the car and an experience we will always remember. We had become very active with the club and in 2011 I became the treasurer and we were showing the 2007 and 1969 regularly. I had started going to MCA National shows, trying to get to the closest one each year. In 2012, I was thinking about adding a SN95 Cobra, but I’d also spent many a weekend day following David & Sherry Johnson’s 98-135 S281 supercharged Saleen Cobra. I really loved the look/sound/performance of that car. Who doesn’t like the sound of that Vortech whining under the hood and the Borla exhaust. As I continued to search for a SN95 Cobra or Saleen, I ran across 97-239, a supercharged Cobra S281 coupe, on eBay out of Salt Lake City and started talking to the owner, getting additional pictures. I had obtained enough of a comfort level from the pictures and talking to the owner to bid on the car sight unseen or at least to be sitting in front of the laptop 5-10 minutes before the auction ended wondering if I really should. At that point, Cher told me to place the minimum bid and see what happened, so joke was on her, we owned the car. It was delivered a couple weeks later pretty much as described, and we’ve been enjoying it since. We’ve had the front valance and hood repaired and repainted, new tires, etc., and we have become active with the Saleen Club of America, I’m currently the GA State Rep for the club. This is where a “mistake” was made. I left my eBay Saleen search active, so that I got an email each day of any Saleens that had been added on eBay. After 2+ years of enjoying the pictures of various Saleens each morning in March 2015, 98-161, another SN95 Cobra S281, but this time a convertible appeared. My first thought was I loved the Bright Atlantic Blue, but hated the white top and Cher seemed to concur. I did go back to it after it didn’t sell the first time and was relisted, and started researching and found it was an unusual color combination for a Cobra and Saleen. Cher and I rationalized that the top would be down most of the time we had it out anyway, so I started emailing back and forth with the owner, talked to him on the phone, and requested/received additional pictures. I also discovered his father was the original buyer, had used it occasionally as a show/pleasure car and had given him the car 6 years prior with 32k miles on it. Unfortunately, he had put another 31k miles on it in those 6 years using it as his “daily” driver. I made an offer on eBay for the car, which was by this time in its third listing, and didn’t hear anything on that offer, the car was not relisted and I figured it had sold locally, so life goes on, right. Then in August it reappeared in my daily eBay email. I mentioned it to Cher before heading off to work, but couldn’t read her level of interest. Thought about the car all day, emailed the owner and asked him if anything had changed with the car since we had talked in the Spring, which he indicated hadn’t except a few more miles. I came home from work and David Johnson and I were texting back and forth about the car throughout the evening and Sherry was discussing on it Facebook with me. About 10:45 my last text to David was that I was going to sleep on it. After about 10-15 minutes, I came to the conclusion that the car was offered at a “buy it now” price of what I had offered earlier in the year and I wanted it, so I hit the “buy it now” button and figured I’d deal with Cher and the consequences. If I had waited until the morning, I would have lost it to a friend in the SCOA who was working a deal on it. The next morning I was sitting eating breakfast, didn’t realize Sherry had posted on Facebook that the car had sold, Cher saw the post and expressed her displeasure that the car had sold, so I played along and acted upset also, but at least now I knew I would survive the purchase. I did tell her the car was ours as I was leaving the house 45 minutes later. I had the car picked up in San Antonio and delivered in Georgia in less than two weeks. The issues/problem areas with the car were not nearly as bad as described by the seller and the pictures. We have had the front air dam shored up to get rid of the inevitable Saleen smile and painted. I did take off the carbon fiber side mirrors and shifter knob and replaced them with the stock ones that came with the car. This is now the car that comes out of the garage most frequently, is a great cruising car, and draws attention wherever it goes, especially the color, and we’ve grown to really like the white top, go figure. We’ve had a great time with these cars and met tons of great folks in the enthusiast world, with the NEGMC, and the SCOA. I’ve served two 2 year terms as president of the NEGMC after my 2 year term as treasurer, and Cher is now in her 3rd 2 year term as treasurer. Who knew that in 1972 when I bought that first 1967 Mustang, that I’d still have Mustangs, that we’d still be having so much fun with them and the people that are part of the lifestyle. Now, as we retire and move to a new phase of our life, we are doing what everyone else does. We have a smaller house, a larger garage, and we look forward to many more years of fun with these cars (and maybe a couple more), the people we’ve met through them and those we will, and continued involvement with the NEGMC and all of you folks.